The start of a new year is a great time to pause, consider the big picture, and predict the future. 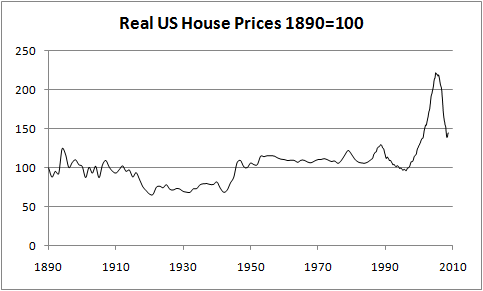 So it’s time for me to update a chart I first ran a while back on house prices. This is adopted from Robert Shiller’s work. He chained together a collection of house price indexes covering different periods, ending with the Case-Shiller Index Composite from 1987 onwards, and then adjusted for inflation. Knowing that recent history, and the near future, is probably of more interest, I have here another chart. 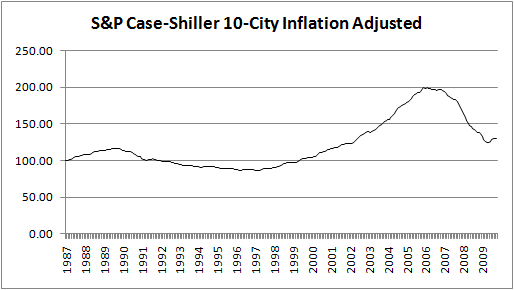 This is essentially a zoom-in of the one above, showing just the Case-Shiller 10 City Composite, which began in 1987. This more clearly shows the recent "recovery" in house prices as a little hook at the very right end of the line. Even in this scale it does not look like much, but it is significant. House prices tend to move in long multi-year trends and a break in the downward momentum that ran from summer 2006 to spring 2009 is meaningful. A week ago, during that delightful quiet period between Christmas and New Year’s, S&P released the Case-Shiller numbers for October. They were flat. (The 20 City down –0.05%, the 10 City up 0.01%.) On a seasonally adjusted basis, which I may never get comfortable using, the 20 City was up a not inconsiderable 0.4%. Not that anybody was paying attention, but the media couldn’t help but to leap on this as evidence that things really were going to hell in a hand basket after all. The Times headlined their discussion as "New Slip in Housing Prices Undercuts Fragile Optimism" despite the fact that the article cited no new slips in prices. So what of the near future, for example 2010? I am a house price bull or bear only in contrast to others. I’m more bullish than the Times, but in truth my expectations are neutral. I think house prices have stabilized and will more or less track inflation for the foreseeable future, as they have in the past. Looking at the first chart above might lead one to believe that house prices have more to fall, as they have not yet fully returned to the pre-bubble price level. That is a reasonable concern, but on balance I am not worried. It is important not to let the epic scale of these charts throw you off. At current levels the real return from house prices since 1990 has been all of 0.60% annualized. That is not all that different from the 0.49% real return from 1950 to 1990 and is well within what I would consider to be more or less tracking inflation. Bears will argue that a new wave of foreclosures, the expiration of government tax credits, and rising interest rates spell doom for house prices. Foreclosures have been working their way through the system for some time and it is hard for me to understand why the volume might increase now. An increase in prices, or even just a halt in the decrease, ought to slow the flow. Also, the recession ended a while back, in case anybody needs reminding. I think the government tax credits are both a delightful thing for those who receive them and another in a series of pointless wastes of taxpayer dollars for the rest of us. But I don’t think there is evidence that they have had more than a negligible impact on the overall market. And let us not assume that they will soon go away. One of the most powerful men in Washington, Harry Reid, represents the worst hit state in the country for house prices, Nevada, and is facing a very tough reelection campaign later this year. Mortgage rates may have been rising a bit, but they are still near historic lows. Moreover, mortgages are getting progressively easier to get as the post-crisis market returns to normal. Not as easy as they were to get in 2005, but a lot easier than they were a year ago. Interest rates could increase meaningfully in six or twelve months if the Fed switches priority from avoiding economic meltdown to avoiding raging inflation. But I don’t think that they would do that in a way that torpedoes house prices. Generals always fight the last war, and ignoring house prices is not a mistake they are likely to make again soon. Will there be down months in the C-S indexes? Yes, of course. The next month to be reported, November 2009, seems like a good candidate. And there will be others. But there will be up months too, and by this time next year I predict it will total up to around nothing. And that’s a good thing. Real prices had gone up before that, but never by so much for so long. It’s not an accident that this happened in the late 1990s. Stocks were more overvalued (and not by a small amount) in the late 1990s than they have ever been before. Many people were under the impression (this impression was encouraged by many investing “experts”) that the values being reported for their stock portfolios were real. So they bought more house than they would have had they known the accurate numbers. And lots of businesses were started by people who thought they had adequate capitalization (again because they treated the numbers reported on their portfolio statements as real). It takes years for all these undercapitalized businesses to fail (people who have put in years of sweat equity quite understandably do not quit easily). That’s why it takes many years to get out of the sort of hole we put ourselves in when we allow Buy-and-Hold strategies to be promoted (and not questioned) for a long time. Every fantasy comes with a price tag attached. Another way to look at this chart: in the last year the Government has made a massive push to save the housing market. They ratcheted up incentives (first a $7500 loan, then an $8000 giveaway to first-time homebuyers, then a giveaway to anybody at all) to lure buyers into the market and reduce the amount of cash they need to save to buy and furnish a home. In tandem, the Fed brought short-term interest rates close to zero, and is almost finished purchasing $1.25 trillion in mortgage-backed securities (toxic and otherwise), pushing mortgage rates far below historical norms. Both efforts reduce the cost (in capital and cash flow) of buying a home. People who couldn’t afford homes in a free market now can, and those who could already can now afford to pay more. Meanwhile, Fannie and Freddie, both Government-sponsored enterprises, and the FHA now finance nearly every new US mortgage, and the Treasury has just increased the ceiling on the losses they’ve agreed to absorb from them in this endeavor from $400 billion to… infinity. They can now make any loan to anybody, at any rate. And so they will, and so they must: willing buyers cannot be turned away in this market. All this effort is in concert with hundreds of billions in other stimulus, to keep more people employed, to extend payments to the unemployed, to help the people who own houses keep them, and to help those who don’t in their quest to buy one. All this effort, this full-court press to save the economy and the housing market, to put millions of people who can’t afford homes into the millions of homes that shouldn’t have been built, and that little hook is all we have to show for it? One can argue, as you mentioned, that the Government’s incentives have had little effect on housing prices, and therefore the rise is due to an honest market turnaround. However, the trillions of dollars the Government has thrown directly into the housing market should have done _something_. The fact that they’ve produced only that tiny blip at the end of the chart tells me that the problems in the market are far larger than we can control. I think prices are destined to fall back to historic (1950-90s) levels, if not further given current oversupply and the weakness of potential buyers in a recession. Don’t get me wrong; this is a marvelous chart. I haven’t seen it anywhere else, and I thank you, Frank, for producing it. We simply disagree on what it says about our future.